Cheap online flower delivery in Riga and all over Latvia in the shortest time. Do you want to save on online shopping? Then a bouquet will be an optimal solution for a gift for any holiday. And it is possible to order cheap online flower delivery across Riga and in any other city of Latvia by convenient service from studio KROKUS. Cheap local flower delivery can be issued on our website in 5-10 minutes. Just few clicks, and you'll get a perfect arrangement of flowers in just a few hours. In addition, cheap flower delivery for mother's day and any other holiday can be ordered by phone +371 200 303 06. Delivery services of goods are widely popular all over the world. Today, to buy equipment, clothes, food, toys and other items, and to get them right on the doorstep of your own home will not make much effort. It is enough just to find a suitable online shop. The companies that sell fresh flowers and original arrangements of them do not stand aside. 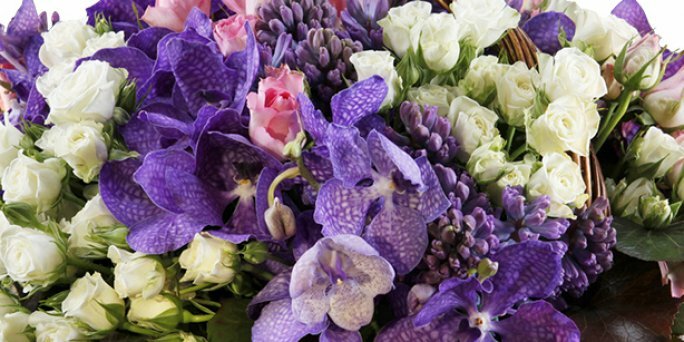 Cheap flower delivery to any address of the capital from our floristic studio! The best online shop of flower bouquets in Riga and all over Latvia KROKUS is pleased to offer its customers cheap online flower delivery to the address, which can be issued when purchasing one or several designer's arrangements presented in the catalog of goods. With the help of our courier service you can get rid of exhausting trips to shops and flower stalls, as well as to surprise and please loved ones with a unique bouquet of fresh flowers without leaving your home or office. ● providing a photo of the bouquet before the delivery and many other services. Thus, by ordering the delivery of a bouquet of flowers in our online shop, you can control the work of specialists practically at every stage: from the creation of a bouquet to the moment of its receipt. How to order a cheap bouquet delivery in Riga (Latvia)? It is very simple to take advantage of the services of our courier service, while saving money. For example, you wish to order cheap flower delivery for mother's day in Riga (Latvia). To do this, make a purchase of the arrangement a few days before the event and indicate the desired date and time of receiving the bouquet. Thus, the address delivery in Riga will cost you 0 euros! If the recipient is located in another city in Latvia, to send flowers will cost from 5 to 25 euros, depending on the location. More precise information you can find out by calling the manager of KROKUS at the specified telephone number.